As we get the quarterly financial reports from the camera companies and the latest CIPA numbers, we can see a number of small changes happening in the market. 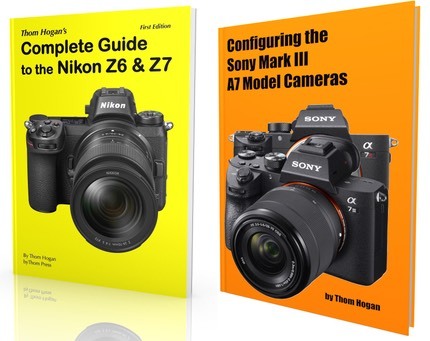 First, Sony didn't break out enough information to speak meaningfully about how NEX and the new A7 variations might be performing, so I can't meaningfully comment on them. Nikon had already reported dropping their estimates on Nikon 1 sales, and it appears they've made another minor revision downward with the latest results. Overall, Nikon actually increased profit margin on slightly declining sales. With Fujifilm and Olympus, we have a bit more information that's of interest to mirrorless camera users. Olympus appears to be going mostly all-in with mirrorless. Or as they put it: "accelerating shift to mirrorless cameras." The specific details were both good and bad. Based upon previous and new numbers, it appears that Olympus is thinking they'll see about 660k m4/3 cameras sold this year. That's still short of what they said it would take to reach break-even with mirrorless, and it also means they only sold 250k m4/3 cameras in the first half of the year, yet it does show first half to second half growth. Update: Olympus clarified the forecast: 400k Pen-type cameras, 100k OM-D E-M1 cameras, and the other 110k is a "swing factor" (which I take to mean an unannounced camera plus results from pushing the existing models harder). But the bad news was two-fold: a cryptic comment that "introduction of new PEN series products delayed" and the fact that Olympus continually forecasts numbers and then misses them in the imaging group. Almost every one of their previously forecast numbers (just three months ago) have been revised downwards already. The only one that they got right was gross margin, which means they've been cutting costs more than anticipated. Still, they're showing a 2.7b yen loss so far in a year they promised break-even results from imaging (now -5b yen loss, so they are expecting a 2.3b yen loss for the second half). Olympus says it is reducing inventory, especially with compact cameras as they move away from that market, but also with m4/3 cameras. I write "says" because they also show elsewhere that inventories of digital cameras are actually up 4% over the end of last year. I originally wrote that I thought the m4/3 fire sales might be behind them, but until they clarify the actual balance of compact/mirrorless inventory, now I'm not so sure. Manufacturing has been consolidated into two sites, Shenzhen Japan and one Vietnam plant. Staff has been reduced 30%, but still is at 6000+ employees, which is about 50% higher than the Life Science business, which generates about the same level of sales. Distribution is slowly being consolidated, and in many cases shipped off to a third party. As I noted, they've been aggressive on cutting costs. As I also noted, they are shifting towards mostly mirrorless or maybe even mirrorless only. To put that in perspective, the forecasts of for October through March show about two-thirds of their camera sales being mirrorless, where last year it was 40%. Still, remember that Olympus has consistently missed on forecasts for several years running now. It's difficult to believe their forecast numbers until they start hitting some of them with consistency. There's great danger in this downsizing strategy. The smaller you get in unit sales (and it's looking like Olympus will end up with <3% of total camera market share based on their numbers; they currently claim they have a 4% share), the less visibility you have in the market. Dealers start dropping the line, for instance. One final note: "further expansion of the OM-D series system planned for [sometime between October and March]." Now on to Fujifilm: Like Olympus, Panasonic, Ricoh, and Sony, digital cameras are not profitable for Fujifilm at the moment. While Fujifilm doesn't break out the numbers as clearly, it appears that they are very similar to Olympus: compact cameras caused huge grief and losses and they're moving away from them towards mirrorless (with some X compacts thrown in, as well). They, too, seem to be taking a "smaller market share with mirrorless cameras leading the way" approach. Indeed, within the imaging group (which includes things that are growing, like instant film cameras ;~), digital cameras are becoming less and less of the overall sales, and everything else in the group is growing. Fujifilm sold a total of 2.6m digital cameras in the first half of their fiscal year, but intends to only sell 2.4 in the second half. 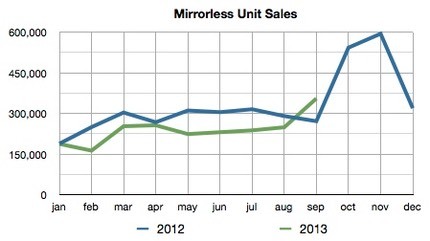 Like Olympus, the total mirrorless units are likely far less than 1m units a year. Finally, if we take Olympus forecast numbers along with the CIPA numbers for the year and best guess projections forward, we can calculate anticipated global mirrorless market share for Olympus: 19.5% (last year: 14.9%; first half of this fiscal year: 16.1%). Plus we can calculate total interchangeable lens camera market share: 3.5% (Nikon, by contrast projects 33%+, and Canon higher than that). To a large degree, we're still in a plateau. A few companies are showing some mirrorless camera growth, but in terms of sheer volume the unit numbers are still relatively small, especially here in the US. Some of Olympus's growth may be coming at the expense of Panasonic, too. Overall, mirrorless is holding its own, but it hasn't significantly altered the overall market shares in interchangeable lens camera sales. Canon and Nikon still dominate with more than two-thirds of that market worldwide. In the US, it actually is worse: Canon and Nikon have over 80% of the interchangeable lens camera sales this year. In parts of Asia, it's better, with mirrorless bringing the DSLR Duo down to something just over half the market.